'Don’t fret Lu, they love you too. You know as well as I do that they only sleep because they are tired, not because they wish to. Look there! A few early stargazers are celebrating you as we speak. I understand how you might feel unwanted, but it’s not so. With time you’ll come to see it as it is, but until then I’ll do what I can to ease your suffering, if you will let me help.' Luna looked up into Celestia’s eyes and saw no dishonesty there, but couldn’t shake the feelings of insecurity and worthlessness that had plagued her for so long. She turned away, slightly ashamed that she still felt jealousy, incapable of looking into her sister’s gaze any longer. 'I know. I’m sorry, I just can’t help but feel this… paleness. It doesn’t matter what you say, I know you’re right, I’m just not sure how much longer I can take this! Night after day after night and always the same, I just feel so… unnecessary. I’m sure it’s just going to take time like you say Cel, I hope you can just bear with me until then, please, I do need your help.' Celestia smiled warmly, came to Luna’s side and extended her wing over her flank like she used to do when Luna was very small. Celestia wasn’t much bigger than Luna herself back then, but she has always felt the obligation to shield her little sister from harm. It just broke her heart to see Luna in so much pain and it comforted her when Luna reciprocated in the way she always has done; she closed her eyes, put her head under her big sister’s and wrapped her foreleg around Celestia’s from behind so they were entwined. 'I love you,' they said simultaneously, mustering a small smile from each of their lips. They stood there a few moments longer before Celestia said in caring tones, 'you have to go soon.' It was true; dusk was ending and Luna would have to go briefly. 'I’ll be here until you come back Lu. And try not to worry so, things will get better, I promise.' Luna’s face seemed brave, but to spend a few moments longer looking at that face would unveil the barely concealed truth; her turmoil was ripping her tender heart. A small tear broke free from under her eyelid as she hugged her sister tightly, untwined her leg and walked away to the horizon. Her job complete, Luna walked back from the horizon towards where her sister said she would be. She went unnoticed. She, however, did notice the quiet. Barely a sound to be heard, which was hardly surprising given the animals’ similar desire for day. Luna looked at the houses with their doors shut, almost all with lights extinguished, and saw no house thriving with life. Parties had ended and all the ponies had gone to sleep. Looking to the rooftop where before had been ponies with telescopes, she saw only the remnants of life; it seemed that these few subjects also had gone to bed. Suddenly the pain was unendurable as Luna considered her irrelevance, her lack of purpose, her sister… She knew she could not see Celestia in this state; she has always tried to hide just how hurt she truly was from her sister, as Luna had known for a long time just how much pain it caused her. Instead of returning to the meadow in which she had been before, she decided to run up a glen that cut into the side of a hill. Upon emerging on the other side, she found herself by a beautiful lake. All was calm save for a slight breeze that ruffled the sweet grasses that were growing thickly all around. Luna looked for a long time at her reflection in the still waters. She saw grace and beauty. She saw elegance and mystery. She saw the reflection of the moon; she scoured its craggy nooks and ethereal skin for some trace of imperfection, but found none. What her sister said was true; she did create a glorious tapestry each and every night. A small smile again began to tug at her mouth as she remembered all of the little talks she and her sister had when they were but foals. They used to talk all day and all night about what they would be, and what they could do with themselves. A small frown began to tug at her mouth as she remembered how even then, so long ago, she had wished that once, just once, she could be the one the ponies looked to for comfort. But she never was; the darkness that she brought often caused anxiety as the noises that seemed so usual during the day inspired fear at night. And since that one little wish her heart had begun to grow less and less sure of itself. With each passing day she saw more and more beauty in the daytime and thought her artistry meaningless. Some bore it well, but nopony seemed to truly adore her night; most merely endured it by sleeping. 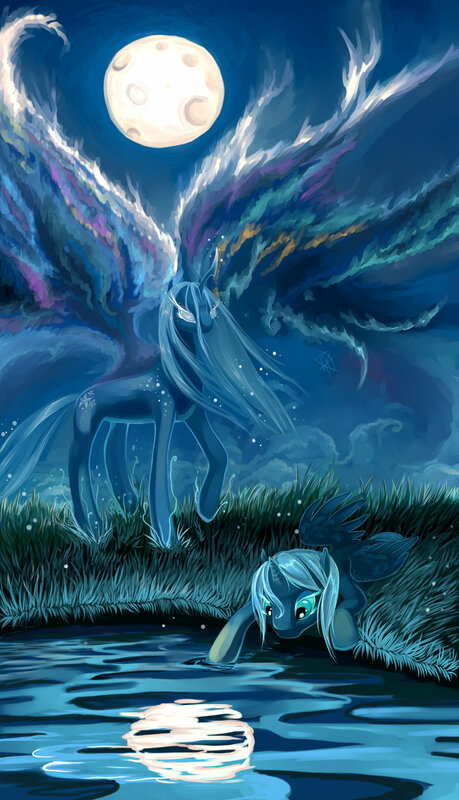 Luna sighed and walked away from the reflection to find her sister. She had regained some of her composure and thought that she could conceal her feelings well enough such that she might spare her dear Celestia that particular breed of pain that can only come from love. She returned to the meadow and, sure enough, Celestia was knelt there looking straight up, captivated by the swirling mass of stars overhead. Upon noticing Luna she stood up and rushed over to her. 'Oh Lu, there you are! Thank goodness, I was wondering where you got to and… well, you’re here now. I had a wonderful idea: we should just fly, all night. What do you say?' Her eyes shone with anticipation and, much though she felt definitively not in the mood for such pursuits, Luna agreed. High up in the air they looked down on Equestria and soared effortlessly around in concentric circles over the whole of their domain. As they did this, Luna began to feel a little better; from so high her tranquil night caused contentment to stroke at her core with the placid lakes gently gleaming in soft moonlight. Her sister had been cruising right beside her the whole time; not rigidly, but certainly supportively. This slightly annoyed Luna as she knew just how fast Celestia could go; it was not uncommon for her to fly so incredibly fast that she caused an amazing explosion of light and sound. She had been doing this less and less frequently and Luna was suspicious that it was for her benefit; Luna has never managed to travel that fast. Strangely enough, this was not one of the things she idealised and hungered for. She much preferred her gift; for though Celestia’s flying could be exceptionally breathtaking, Luna flew with great subtlety. Her wings barely need move if she wished and by tilting just a few feathers she could, with her lithe frame, put her sister to shame. She very rarely performed acrobatic feats, but when she did they were undoubtedly the most refined and noble manoeuvres that Equestria has ever experienced. As with all things, Luna valued the art of subtlety above almost all else. Unfortunately, Luna never displayed her prowess in front of anypony and, perhaps saddest of all, this includes Celestia. 'You do know that if they got enough sleep and awoke they would be humbled by this majesty, right?' Celestia enquired, an intriguing look upon her face. A small, slightly sad smile erupted from Luna’s lips. 'I know Cel, I know'. The saddened smile persisted as Luna looked around at her dusky clouds, their barely perceptible wisps curled in on themselves like fragments of a haunting melody. The ghostly hazed circlets that surrounded the moon interfered with the clouds to form a tangible illusion within which one could gaze for eternity, finding only more and more layers of fragile, tender rolling banks of breathtaking cloud formations. They spread in all directions until the eye could distinguish no further separation; their quilt like texture softly blanketed and warmed the stars. The dark blues and deep black crescendoed together to form the most idyllic scene Equestria would ever witness. Luna stopped in mid-air effortlessly and immediately, Celestia shot past briefly before slowing and arcing round. Luna didn’t understand; they’d never even talked about doing anything this radical before. It went against everything their parents had told them when it transpired that they would be the ponies responsible for the solunic cycle, the cycle of sun to moon to sun again. The whole notion was absurd; Celestia clearly must have spent a great deal of time contemplating the potential benefits and harm that such an event could cause and then reached the conclusion that it is worth the risk. Alternatively she had not done so and, upon finding Luna’s dismay no longer tolerable, simply concocted this plan in an instant. Regardless, whether planned or not, nothing made a difference to how fervently she believed in the validity of it. Her eyes were confident and her voice was strong and, though she cannot foresee how events will develop, she clearly did not believe any ill could come of this idea. 'I feel quite the same way Lulu.' For the first time in so very long, Celestia was entirely happy; Luna would get the recognition she deserved and with this recognition she was sure to be uplifted. And this memory, high above the textured clouds in the perfect night with each so happy and all the world at their hooves, the twinkling stars showing their appreciation and their shared tears of joy falling endlessly to the ground below, would serve to become the most valued, visited and celebrated for both of them. Not since their foalhood had they experienced such undiluted happiness, such lack of worry, but now they were old enough to enjoy it and understand it all the more. 'Sister, I sing for you.' Luna said shyly. It was not like her to speak so plainly. It was not like her to speak dishonestly that is to say, but as each passing year brought her no salvation she had learnt to greatly fear rejection. Alongside her everlasting fear of abandonment, this fear of rejection had led to her habit of hiding almost any emotion of any kind. With the promise of what the continuing night would bring, however, she had lost those fears almost in their entirety, allowing her to become transformed more into the amazing and breathtaking siren of song and elegance that she should have always been. Her mane shone more brightly, speaking of the hidden and gorgeous twilight within, her eyes too followed suit. Again, it was now that the best example of beauty that would ever be seen in Equestria takes place; within her eyes the teal sparkled with zeal and without limitation, and anyone seeing such a sight, from suppressed despair to unbridled delight, would surely agree. 'I will never forget this night Celly, I only wish that I could give you a gift as grand.' Her brow crinkled slightly as she said this, knowing that she would never for as long as she lived be capable of repaying her sister, although of course this would not be for lack of trying. 'You already are.' Celestia clearly had never had issues with clouding her emotion from others, she unashamedly displayed her sentiment and did not yet understand how anypony could be any different. She looked at her sister fondly and with admiration, feeling proud to have brought about such a dramatic change with what to her was nothing, a paltry gesture at best. Such was the nature of her modesty that she doubted just how much this small token of appreciation would heal her sibling’s fragile soul. They had swooped over almost all of Equestria by the time the earth-ponies begin to wake (naturally possessing such jobs as tending to crops led to their usually being the first to do so). Also naturally, with the lack of sunrise these ponies took a much longer time than usual to truly waken, their minds confused by how rested they felt despite the dark. Why haven’t they come out yet? Something is wrong. They think that the day is still yet to come, so they don’t come out. But when they understand that the night is lasting longer they will understand. As soon as they are entirely refreshed surely they will come outside and play. At the very least they’ll convene to talk about what is happening. It is already a few hours past that mark that farmers usually come outside. I wonder why that could be...? Could it be...that they’re hiding? Oh, of course, because they’re so afraid of night, because they hate it. Come on! Who are you trying to convince here? They’re just having a lie in because they don’t know what time it is. I just can’t wait to see the looks on their faces when they come out and dance in the moonlight! Her doubts had then stilled, although it was an uneasy stillness, similar to the way a cat calms itself before springing for the kill. 'Oh, it does look just lovely there. I’ll race you!' They laughed as they speed toward the ground, Celestia holding back only to sprint at colossal speed and arrive at the same time as her slightly sister. They settled under the tree’s blossoming branches; a few of the blooms had already nestled on the ground before them and there was a sweet smell in the air. Celestia shuffled over and snuggled up to her sister, in turn Luna almost seemed to burrow into the fine sparkling rainbow mane. Breathing deeply but breathless with anticipation at the same time, she kept an eye on the doors. Surely somepony would have looked at a clock by now? So why haven’t they come out? Could it be they don’t want to? I can’t believe you let yourself get your hopes up! It’s not because they’re tired they only come out at day, your nights are pathetic! Seriously what were you expecting, a parade? Some kind of celebration? Face it, in all these years you don’t think that one pony has thought 'I wonder what night is like'? They all do! They just don’t like it, the sooner you come to terms with that the better off you’ll be. Just wake up, it doesn’t matter what you do, they will always hate what you do, sun-killer! Bringer of darkness! Everything you are, everything you do is just… bad, worthless, worse than worthless; it’s a waste! It’s always the same tune with you isn’t it? For so long you have been harbouring this grudge, and now that you realise it’s petty and invalid you’re desperate! That’s what you are, desperate not to be proven wrong. To think I’ve spent all these decades defending you from my sister, I have half a mind to tell her all about you. You know what that would mean? No more talking, she could crush you in an instant so I’d shut it if I were you. Stay your ranting or else I will be sure to deal with you once and for all. Sometimes I think it’s kind of sad just how repetitive you can be. Honestly, you’re not just wrong, you’re also boring. And what’s wrong with talking to my sister? What, it’s better to be a stoic fortress of solitude? Never deigning anypony permission to board my grand battlements of arrogant self-reliance or cross my moat of surly, indignant deceptions of well being. Well you know what? I’ve had just about enough of you now shush! I mean it! I’m not going to talk to you anymore. Goodbye. Suddenly, flare! A lantern had come on in one of the houses and the shadow of a pony stretched over the curtains. 'You ready?' Luna’s expectations were so grand that she hadn’t noticed much of her mind’s parlay; indeed, the tempest had gone unnoticed save for that slight…. niggling. Another light came on in a different house, and from both houses ponies could be seen peering out of the windows at the high moon. Then they both vanished from sight. More lights flared on from within, then burst out into the street as one of the doors opened. An earth-pony of medium stature came outside and looked straight up, briefly, before looking around whilst trotting over to her neighbour’s house. Even before she reached it, that door too opened. They started conversing but Luna was too far away to hear the words, instead she could only hear the slight tones. Luna stood up and walked a little closer to the couple, but stayed out of sight; her shyness was still almost all encompassing. For many years she had actually been in complete seclusion from all save her sister. Upon reaching a bushel, behind which she crouched, she heard a burst of laughter. Luna’s ears pricked up in delight. In just that moment, the world became a shroud of florid colours and scintillating smells as the laughter tickled and caressed her ears. The whole world, in that moment, crystallised into a perfect experience that allowed all the centuries of jealousy and insecurity to slip away sweetly as the laughter lovingly curled up into her brain. At that moment, the entire world culminated into an untainted, utopian dreamscape made of glory and nectarous, saccharine rapture as the laughter tickled her ears. It tickled. In that peculiar way that it can do, the laughter tickled with the tone of anxiety. Just as quickly, the world froze into a mocking rictus of perfection, still the same world, only a cruel imitation. Luna’s breath was shallow and fast, she could no longer hear as her ears pounded with blood. A few despondent, dead tears crafted their way down her face and splashed, pitifully, against the coarse and uncaring stones near her feet. Celestia, on seeing her sister’s perishing features, rushed over. Her countenance in turn declined into one of panic and despair. 'They. Are afraid.' At this she turned her vacant eyes on her sister and again with her lustrous and lyrical voice, now afflicted with dire and harrowed inflections, commented: 'They are afraid'. 'Oh Luna, oh Lu you don’t know that. Let me go talk to them and I’ll explain and you’ll see…' Celestia’s voice tailed off into a dazzling smile, but its radiance could not mask the concern firmly lodged within her purple eyes. Also there…regret. She trotted urgently, but not hurriedly, over to the two ponies. Luna stared at the floor, vacuous save for a single point deep within her that poured forth torrents of loneliness and anguish, and another that stood resolutely before the deluge. The dejection began to drown the latter and she was happy to let it; her spirit was almost entirely depleted. Luna stared at the floor, her eyes slowly focusing on the pool of tears before her. It seemed strange to her, the way that they had mixed with the dirt. It almost looked like in her sadness she had created a congregation of small and blissfully unaware creatures. The way that the individual tears seemed to gather and coalesce was rather particular. In her state she thought of how, had she been less sad, had she shed but one tear it would be lonely. It caused her distress to think of a single tear with no kin to bear its company. In a single tear surrounded by so many happier things, could there not be any worse fate, she thought? She absent-mindedly stirred the small patch of ground until all of the tears were saturated with earth. A little of the mud grasped her hoof. For some unknown reason, upon seeing this, Luna slowly snapped out of her reverie. No. You listen. You listen. Celestia will… Celly is going to… Cel…. Celestia approached slowly. It’s such a shame that she had never before seen any reason for dishonesty until now, for her inexperience caused her to not consider her face carefully enough; inscribed upon it were good tidings and comfort, but merely skin deep ones as the structure underneath was one of fear. That face spoke volumes to Luna of fear at breaking bad news, of not knowing how to tell her that all she wished for is withering and dying without much optimism for its recovery. Luna turned away, not able to sustain any longer any semblance of form that she wished her sister to see; she believed the death of her hope had left her nothing to offer. Again, she looked at her creation on the jagged and scabrous rock; the mud was still there, unchanged, unweathered. It might stay there for some great time still, she thought. Knowing her voice was hardly up for any kind of discussion, Luna sprinted away and jumped into the air, snapping her wings out to try and catch the winds from a storm that only she could feel. 'Lulu! LULU!!! Wait, just give them time to adjust, LULU!!! PLEASE!!!' Blind with tears, Luna separated herself as quickly as she could from the grieving screams of her beloved sister. The wind rippling across her smeared those delicate droplets, those fine gossamer weavings of regret for nights that could be no more, those desperate, unhappy passengers who had left their safe homes for seas unending, into long streaks that trailed along the length of her coat. And there left behind were the traces imprinted onto her fine and comely coat, streaks of salt that clung tentatively to her immaculate hairs with earnest deliberation. Luna’s head raised to stare into the middle distance, focusing on nothing in particular. Her eyes became wide with alarm. NO, no more talk from you! Can’t you see it now? A beautiful moonscape forever more! Well, at least until those subjects, I mean, your subjects, fully appreciate what you’ve done for them, what you do for them each and every night! 'Cel, I…' This was as far as Luna got before she lost all control of her entire body; now her eyes just stared endlessly into the lake’s surface. Whether seconds or years were passing, what was left of Luna couldn’t tell, but what she could tell was that something was happening. Entombed in her own body, screaming with no voice, and nopony to hear, she was forced to gaze at her reflection wherein change was occurring. Her slender and unassuming form extended to become more powerfully built. The eyes grew out of their devoid state into a bitter, cold one. And so ended Luna, one of Equestria’s greatest progeny and the most gifted artisan to ever live, who would need to wait more than a thousand years to be released of her terrible affliction. Only after such an eternity would Luna the immortal captive give way to Luna the singer, and after so much torture, the hope for life which she attains from freedom would feel sweeter than any she had known before. Even so, a small part of her would forever, will forever, remain encased in shadow. Luna may recover, but she will never be complete, she will, in part, always remain captive to the corrosive Nightmare Moon. Image by DragonTaxia of DeviantArt. Thanks for making it!